When GoodWeave’s inspectors found Samrul working at a dingy carpet loom in Uttar Pradesh, India, they were greeted with confusion—and even hostility—from the 15-year-old they were trying to help. It was a perfect illustration of just how complex the issue of child labor can be when it’s driven by sheer economic desperation. Inspectors were able to liberate Samrul from his loom, and to return him to his family in the West Bengal city of Malda. There, however, they learned that the boy’s father, who earned a meager living as a street peddler, hadn’t sold him into labor, as might have been suspected. 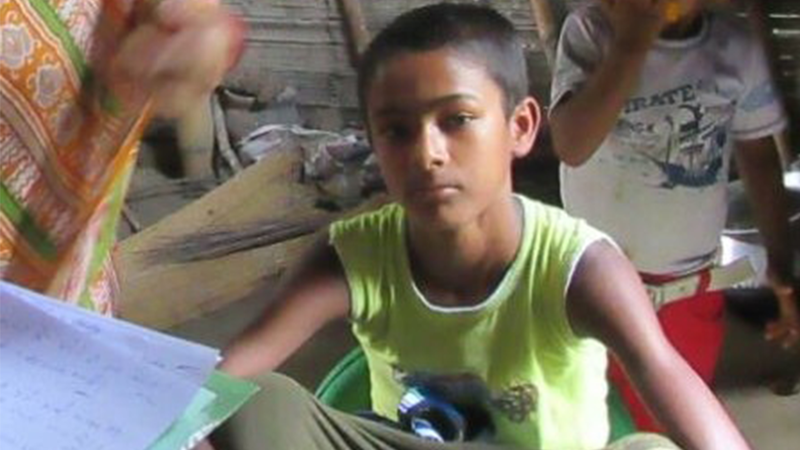 Six years earlier, and frustrated with the slow academic progress he was making, Samrul had dropped out of his village school. His life took an even more drastic turn when the temporary dwelling he shared with his family was washed away in a storm. They had no choice but to move in with Samrul’s older brother in Malda. Soon Samrul and eight members of his family were living together in a tiny house with impossibly cramped surroundings and no toilet facilities. In his frustration and desperation, Samrul ran away. Upon encountering a group of weavers at a Malda railway station, he was told that they were traveling to Bhadohi, the nearby carpet district. Samrul joined them, believing it would lead to his ultimate economic freedom. Soon thereafter, however, he found himself working long, draining hours in an emotionally and physically oppressive environment for food but no wages. Now accustomed to running, he managed to extricate himself from this carpet-weaving facility—only to arrive at another, where conditions were slightly better but where he was still given a paltry wage for his 10-hour days at the loom. It was there that GoodWeave’s inspectors found him. A recent visit to Samrul’s home in Malda revealed a teenager who is genuinely grateful to be back with his family, but who is still reeling from the trauma of heading out on his own—as a child—in search of a wage. At his age, and lacking an education, he sees few avenues worth pursuing and can be pessimistic about his future. Fortunately, he and his parents have maintained their connection to GoodWeave, which has worked with them to explore Samrul’s options. Thanks to GoodWeave’s programs for adult weavers, these options include returning to the labor market one day soon with a much greater skill set, one that will give him the maximum bargaining advantage in securing decent work and earning a living wage.